Hot Docs is pleased to announce that it will pay tribute to award-winning Canadian filmmaker Julia Ivanova with this year’s Focus On program, an annual showcase of the work of a significant Canadian filmmaker. Hot Docs will screen a selection of Ivanova’s films in the Focus On program during the 26th annual Festival, April 25 to May 5, 2019. The films in Focus On Julia Ivanova will be announced in March, and Hot Docs is pleased to announce that Ivanova will be in attendance at this year’s Festival. 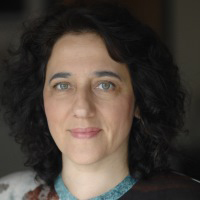 Julia Ivanova has received many accolades for her compelling films, including the award for Best Canadian Feature for Family Portrait in Black and White at Hot Docs 2011. Her films include From Russia, for Love (2000); Fatherhood Dreams (2007); and Limit Is the Sky (2016), which won the Colin Low Best Canadian Documentary Award at DOXA 2017. Her documentaries have screened at Sundance, IDFA, and the Chicago and LA film festivals, among many others; she is currently working on the feature Pipeline in Paradise, about two opposite human forces in Canada that are connected by the Trans Mountain Pipeline. Born and raised in Moscow, Ivanova immigrated to Vancouver in the 1990s; since then, she’s established herself as a balanced and empathetic cinematic voice, digging into the dilemmas perpetuated by the search for a place, love, family and meaning by those who have two homes and two identities. With a focus on capturing the complexities of human nature, Ivanova brings her signature non-judgmental style to the telling of unique Canadian stories. For more information on Julia Ivanova please visit, www.juliaivanovafilms.com. Past Focus On honourees include John Walker (2018), Maya Gallus (2017), Rosie Dransfield (2016), Carole Laganière (2015), John Zaritsky (2014), Peter Mettler (2013), John Kastner (2012), Alan Zweig (2011), Tahani Rached (2010), Ron Mann (2009), Jennifer Baichwal (2008), Kevin McMahon (2007), Serge Giguère (2006), Larry Weinstein (2005), Nettie Wild (2004), Shelley Saywell (2003) and Zacharias Kunuk (2002).